Welcome back! If you’re just now joining me, then you’ll want to take a look at the first two days in this little Inspec journey. In Day 2 I told you that the two resources that you’ll use most with Inspec are command and file. The command resource basically reads the output of the command that you give it, and you pass or fail based on that output. And the file resource basically passes or fails based on what the control says the different aspects of that file should or shouldn’t be. 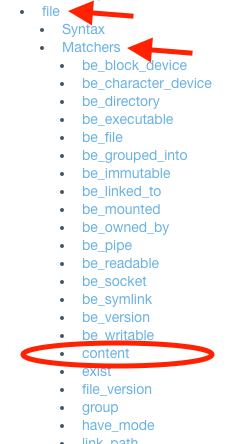 So far I’ve found the simplest file resource to be the content matcher. Today we’re going to do just that. You’re going to write a control that looks for specific text within a file. Easy but mighty. So do you remember our workflow and windows we need open? Open these up, and make sure your CentOS vm is up and running. Even though we are dealing with a file resource this time, the workflow will still be the same. I found that when I follow this workflow exactly, it goes way faster and I make fewer mistakes. So head over to Nathen Harvey’s workshop, and let’s do the second one since we did the first one last time. Open the CIS CentOS Linux 6 Benchmarks v1.1.0 that you downloaded, then look for our command inside there: 1.2.2. Remember how we need those bits of info to fill in our control? That tells us that gpgcheck should equal 1, right? So what if it doesn’t? We’ll need to edit the file if the audit failed, so let’s do that by ssh from the command line. Once you’re in sudo nano /etc/yum.conf' Then add the text, write out Ctrl+O, and exit Ctrl+X. Then run the command again to make sure you fixed the problem. I told you already that command and file are the most common resources, and I told you already that we’re going to be doing a file resource today. But how do we know that? Well, simple. The CIS audit wants us to look in a file. Let’s head over to the Inspec Reference page and look at the options in the right side bar menu. We want to make sure that content exists within a file right? So we’re going to see if we get a match for the content when we look inside that file. The audit already gave us a regex, so we don’t need to create one. On to #7. Update: I’ve since changed my tune on this a bit. Please see this post on Regular Expressions so that you can take care to use the best possible regex when necessary. I ran into controls that I had to have sudo access to run. So after that I decided just to run --sudo-password=PASSWORD --sudo every time. I’ve written a lot more of these controls since last time, and each time it gets easier and easier. The first few took me a little while to navigate, and then I got stumped by the sudo issue, but after I got in a groove, each one took me just a minute or two.